← Beam RV Vacuums – Should you get one? When a homeowner is looking to purchase a new central vacuum system in their home they are constantly bombarded with figures on airwatts, suction power, inches H20, etc. One of the major key factors that a lot of people selling these machines overlook is whether the unit is filtered or cyclonic. This detail has a large effect on where and how you install a central vac. Here we will explain the key difference between these two types of central vacuum systems, and why one is better than the other. The cyclonic central vacuum system is very similar to what is used in a dyson vacuum. Don’t fall for the gimmick of this is new “technology”. Cyclonic separation has been around for almost 30 years. This type of technology is used by vacuflo, powerstar, imperium, and other brands. 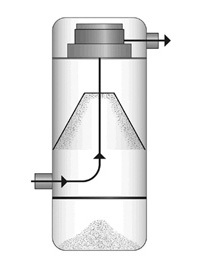 With cyclonic separation the dirt and debris is spun around in a chamber through the use of the suction. The heavier debris and dirt fall to the bottom of the dust chamber while the clean air is pushed out through the exhaust. 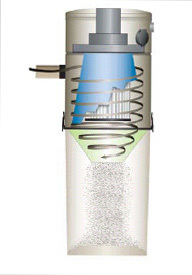 The problem with such systems is that the exhaust is not fully filtered, and 3-5% of the dust and debris exits through the exhaust of the central vacuum. In order to combat this, these machines must be exhausted to the outside of the home. If you want to place the central vacuum in the basement or utility room, you have to spend the extra money to have the installer exhaust the unit. The filtered central vacuum system is the preferred type of unit. Rather than have all the dust and debris fall into the dustbin, it is automatically sent there, and the existing airflow is sent through a filter system. All the dust and debris that remains is filtered out and falls into the dustbin. For this reason these units do not need to be filtered and can be placed anywhere in a home. Brands such as canavac and the beam central vacuum use this type of technology. They are also two of the largest manufacturers of central vacs in the world. Besides the filtering technology, these units are basically the same in operation. They all have a utility valve at the front where you can connect a central vacuum hose to clean up the garage and other spaces, and they all use the same accessories. If you are thinking about purchasing a unit though, we would recommend going with a filtered system. This will save you time, money, and you will have the convenience of putting it wherever you want in the home. Thanks for reading, and happy cleaning! This entry was posted in power units and tagged beam central vacuum, beam vacuum, cyclonic central vacuum, filtered central vacuum. Bookmark the permalink.